FACT CHECK: Kanye West Proud He Doesn't Read Books? 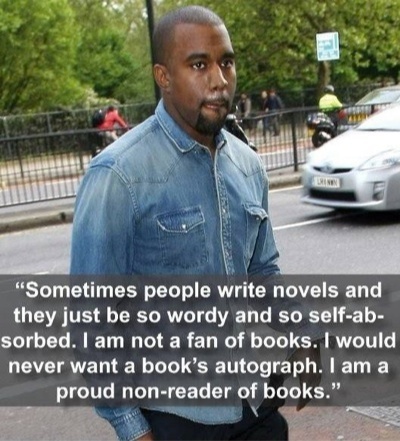 Kanye West Proud He Doesn't Read Books? Rumor: Rapper Kanye West said he is proud that he doesn't read books. Origins: On 13 February 2015, the web site for the UK version of Marie Claire magazine published an article titled “21 Kanye West Quotes That Completely Baffled Us.” The collection of West’s comments was curated in response to the rapper’s behavior on the evening of the 57th Annual Grammy Awards, particularly his rant about musician Beck as the latter received the “Album of the Year” award. Marie Claire. 13 February 2015.